The season closed on a memorable evening for the members of Lodge of Israel No 1502 at Liverpool Masonic Hall. The membership of this long-established lodge has a very compatible and diverse background and there is something special regarding this lodge, which is reflected in the number of 50 year celebrations the lodge has held in recent times. The latest has taken place in the traditional home of the lodge, Liverpool Masonic Hall on Hope Street. Since it was consecrated, the lodge has met continuously at the Masonic hall except for a short period following a large fire within the building in the late 1960’s. Pictured from left to right, are: David Johnson, Barry Elman, Louis Collins, Derek Parkinson, Mark Matthews and Ian Halsall. The meeting was held on a warm sunny evening within the Roman Suite and was opened in the usual manner by the WM Barry Elman assisted by his wardens, Ian Niven and Ray Sephton. Barry was next pleased to receive a deputation representing the sister lodge, King David Lodge No 7256 led by their WM Phil Sorsky. Phil, who was also WM of the sadly missed Menorah Lodge No 4513, thanked Barry and the members of Israel Lodge for their warm fraternal greetings. After welcoming the guests Barry was pleased to admit and welcome Provincial Deputy Grand Director of Ceremonies Ian Halsall who requested all to stand to receive Assistant Provincial Grand Master Derek Parkinson. On this occasion Derek was accompanied by both the Chairman and Vice Chairman of Liverpool Group, Mark Matthews and David Johnson. They entered to the ambient background of ‘Crown Imperial’ majestically performed by organist Ian Jones. Barry offered the gavel of the lodge to Derek, which on this occasion was graciously accepted, and at this point Derek requested that the lodge tyler David Jones be admitted to witness the celebration which was to follow. Derek next thanked Barry and the brethren of Lodge of Israel for inviting him to share in this special jubilee celebration. He added to this by saying: “It is one of the benefits of holding a senior position in the Province, that one can celebrate with a brother as he reaches a milestone in his Masonic career. It is an honour to be present this evening and pay tribute to Louis Jacob Collins, Past Provincial Junior Grand Warden of the Province of West Lancashire.” Visiting Louis at his home some weeks ago Derek remarked on what an interesting and enlivening conversation they both had and he found out much of what Louis had achieved in his younger days. To begin the tribute Ian Halsall escorted Louis to be seated in the centre facing the east towards Derek. Addressing Louis, Derek mentioned he had taken the chair at over 40 celebrations of a brother’s golden or diamond jubilee and for the majority of them when he had been preparing he’d usually included information about things that happened in the 1920’s and 1930’s, from the time that they were born. But tonight, as Louis was initiated into the lodge at the young age of 26 years, the story would begin in 1942, right in the middle of the Second World War. Louis was born in 1942 in Dublin, and at the time a state of emergency existed in Ireland which remained neutral throughout the war. This being proclaimed by the Irish Government in September 1939, allowing them to control internment, censorship of the press and control of the economy. Here in the United Kingdom, particularly in Liverpool, for the previous two years many suffered the ravages of the Blitz, in one of the most intensive and prolonged periods of bombing during the war, causing heavy loss of life and a huge amount of damage, sometimes with whole streets destroyed. Amidst this death and destruction across the globe there were also more positive events, and as a doctor, Derek looked at medical developments at this period and noted that in 1942 Karl Dussik, a neurologist, was the first to use ultrasonography for medical diagnoses. He transmitted an ultrasound beam through the human skull in his attempts to detect brain tumours. In the same year Eastman Kodak became the first manufacturer to market colour negative film, now superseded in general use by digital photography. Moving on to other things happening in society in general, much is now heard about equality in the workplace for women, particularly that they should be paid the same amount as a man for doing the same job, but in the 1940’s there were other differences in terms of employment and remarkably until the Education Act of 1944 women teachers were not allowed to marry. In continuation, Derek reminded everyone, not just Louis, saying that death and taxes are the only two certainties in this life, and it was in 1944 that the Pay-as-you-earn tax system came into being. Previously the government collected the tax that was due from the previous tax year, now with the new system it meant that the government received the tax on money almost as it was earned. 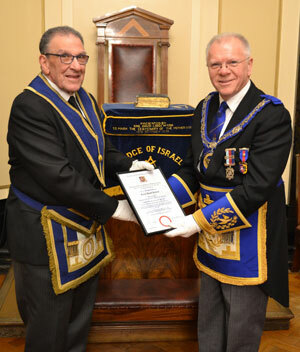 Louis Collins (left) receiving his 50-year certificate from Derek Parkinson. In 1955 the first polio vaccine was developed by Jonas Salk, and four years later the microchip was invented. In the early sixties the Beatles released their first single, while Spiderman made his appearance in the comics, and the BBC broadcast the first episode of Dr Who with William Hartnell in the title role. Just before the end of the decade, in the year that Louis was initiated into Freemasonry, the first manned Apollo space mission was launched. It was here that Derek reiterated the purpose of the evening, to celebrate his initiation as a Freemason in 1968, and his life leading up to that event. He explained on how he had visited Louis at home and spent quite some time listening to Louis as he recounted fond memories of his parents and their family life. As is the tradition in the Jewish faith, Louis was named after his paternal grandfather, a Cohen, but owing to the events unfolding across the globe, with a possibility of an invasion of the British Isles, Louis’s father thought it expedient to change the family name to the more widely known Irish name of Collins. At the time of his birth the family ran a coal business in Dublin, after settling there after fleeing Europe due to previous religious persecution inside Russia and the Baltic states. Of the four grandparents, only one, a grandmother, originated locally, born in Liverpool. Louis was the first born of five boys and attended, like most of the local Jewish boys in Dublin, the Protestant St Andrew’s College. After passing the matriculation exams, which are a bit like the Scottish Highers, somewhere between ‘O’ level and ‘A’ Level, Louis was accepted at the Royal College of Surgeons in Ireland to study dentistry, qualifying as a dental surgeon. During university, Louis took a summer job in Blackpool, where his mother’s brother lived, and secured a temporary job on the world-famous Blackpool tram’s as a conductor. Working between Starr Gate and Fleetwood, Louis decided one evening that the ride would be enhanced for the passengers at the time of the illuminations, by switching off the tram lights as they went along the track. The passengers apparently now with a much better view were much pleased, not so the tram company. He got off with a severe warning and didn’t try that again. An advantage to the job was purely coincidental, but never the less, gratefully received. At the end of his late shift he called at the local fish and chip shop, which closed around the same time, and so the kind owner tended to empty the fryer and made sure Louis had oversize portions to keep him well fed. It has often been wondered how Louis fitted study into his busy schedule for beside working in Blackpool in the summer, whilst at university in term time he also took up fencing, the foil being the weapon of choice, the very flexible one that rang a bell when you scored a hit on your opponent. He also learned to sail dinghies at the Royal St George Yacht Club in Dun Laoghaire harbour, Dublin Bay. After Louis had qualified as a dentist he had to secure a position and as there wasn’t any National Health Service in Ireland, the only way of joining a private practice was to buy a share in the business. Louis therefore decided to apply for salaried dentist jobs in England, and in particular in Liverpool, securing his place for six months to work for Mr Meredith, a dentist in Garston, to assist him with his long waiting list. At the end of this period he moved to Mr Foster who had dental practices in Walton and in Manor Road, Woolton, working for two days in one surgery and three days in the other. Mr Foster and his wife Erica were very keen bridge players and as Louis had mentioned that he had played a bit at university they invited him along to the Liverpool Bridge Club which then met at Upper Duke Street. This turned out to be very fortuitous as it was at the club that Louis met his future partner for life, Jillian. Her father assisted with financial help to set up a dental practice and together they found one off Smithdown Road that was available to buy, which Louis built up over the next few years and remained there for over 37 years until retirement. As a point of interest, Louis and Jillian still play bridge regularly at the Liverpool Bridge Club although it’s now moved to the corner of Croxteth Road and Green Heys Road. The couple have three children, all boy’s, and all happily married, although rather spread out, with the eldest living in New York, the second in London, while the third is nearer home in Manchester. With regard to the life of Louis in the community, he was a regular attender at the Greenbank Drive Synagogue where he was the senior warden of the Hebrew Congregation for several years. This has since closed and he is now a member of the Allerton Hebrew Congregation and attends the Synagogue on the corner of Mather Avenue and Booker Avenue. He has quite a lot of other interests and hobbies to keep him busy, and besides playing bridge, Louis excels in baking bread, biscuits, cakes, is a keen photographer, including photo editing, and more recently has taken up art classes. Derek added that from the latest painting Louis had shown him, Louis has talent and is doing very well. Derek now requested David Waddington to give a resume of Louis Collins regarding his activities within and connected to Freemasonry. David stood and started by saying to Louis, “We are here to celebrate your 50 years in Freemasonry and so should turn back to 13 May 1968 when you were initiated into Lodge of Israel at the annexe Greenbank Drive synagogue. It would usually have been at Hope Street Masonic Hall, where the Lodge has always met since it’s consecration in 1874, but the lodge had had to temporarily relocate after the fire in Hope Street. Your interest in Freemasonry had come from members of your family. Your father and grandfather were both members of Lodge of Israel No 126 Dublin. Your grandfather, who you were named after, had, according to the return sheets of Lodge of Israel No 126, joined from Lodge 238 New York (believed to be Orient Lodge in the district of Copenhagen). His date on joining Lodge 126 given as 24 January 1920. During the next 10 years Louis regularly attended the weekly stewards practice sessions so that by the time he was junior deacon he was well practiced in the first degree ceremony. Louis was installed as WM in 1981 and had an excellent year in office and as was the case in the 1980’s there was a ceremony at almost every meeting and so he was able to carry out second and third degree ceremonies and at the end of the year install your successor. Louis received his first appointment in Provincial Grand Lodge in 1992 as Past Provincial Junior Grand Deacon. He held the office of treasurer of the lodge for 10 years and he received promotion to Past Provincial Junior Grand Warden in 2000, his current rank. he continues to hold office and has been chaplain for the last 10 years. Turning to the Royal Arch, Louis was exalted into Menorah Chapter No 4513 on 18 January 1973 and remained a member until it closed in November 2016. During his membership he was installed as first principal in 1988 and held the office of charity steward for 15 years up until the date the chapter closed. Louis holds the high rank of Past Provincial Grand Scribe Nehemiah. He is also a member of the Mark Master Masons degree. Pictured from left to right front row, are: Stuart McQueen, Ian Thompson, Paul Rattigan, Lou Collins, Phil Sorsky, Steve Kayne, John Sephton and Chris Mullins. Back row: Ian Niven, Barry Elman and Ray Sephton. This was the point at which Derek requested group vice chairman Dave Johnson to read the jubilee certificate issued by the Provincial Grand Master Tony Harrison, after which Derek left the pedestal to personally present Louis with this framed memento of the occasion. Addressing Louis directly, Derek said: “You have served your local Jewish community over many years and contributed to Freemasonry in this lodge and this city and I know you have certainly got a great deal of pleasure and enjoyment from all that you have done, and so it is a great honour and a privilege to say to you Louis, thank you for all that you have done for Freemasonry and the wider community, and congratulations to you on achieving 50 years as a Mason, and we all look forward to seeing you enjoy many more years as a member of this great order.